Framing diplomas or certificates often warrants much higher quality components in a design. An important document should be framed in a sophisticated fashion. 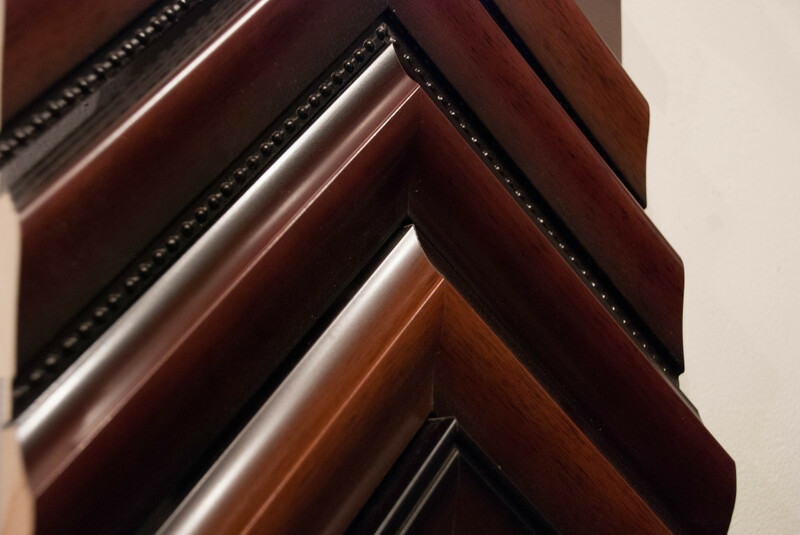 Typically a refined, dark frame is used, such as, cherry wood, matte black, mahogany, walnut, rosewood, or black walnut. At least three mats are used. A medium dark suede mat is an excellent choice for the top mat, typically a navy or crimson. Most certificates and diplomas are a warmer, cream color. So, for the bottom layers of mat board a similar cream color is good for the middle layer and a black or gold mat on the bottom layer. It is also nice to see the school color for one of the bottom mats on a diploma. The last and one of the more exceptional additions is the fillet. For the more extensive designs, two fillets would be used. The first one, typically gold, is stacked in the frame to create a nice accent. The second would be stacked within the mats to tie the whole design together. If a military certificate is being framed, there are other options for the design. Metals, ribbons, and pins typically accompany these certificates and they look great when framed together. After all of the other components are applied, these items may also be mounted on top of a mat next to the certificate and a spacer will be used to create extra depth.